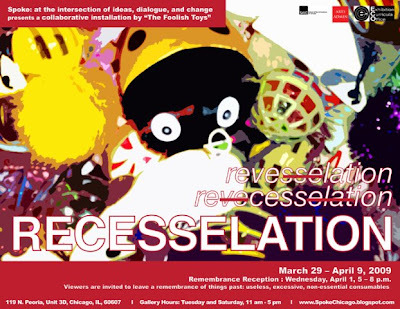 consumption | The End of Something..
Rememberance Reception April 1, 5 – 8 p.m.
“The Foolish Toys” will build a post-decadent shrine or memorial to our excessive past. Materials, objects, sounds, actions, and images, will be incorporated into one large sculptural form that evolves over time. Viewers are invited to leave a remembrance of things past: useless, excessive, non-essential items.